Thanksgiving is soon upon us. We have so many things to be thankful for. 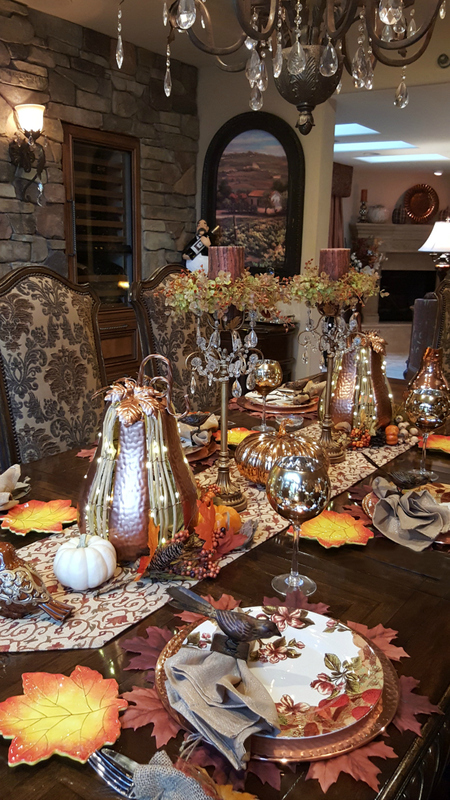 My last tablescape for this season is birds and gourds and of course pumpkins. These charming bird plates I found years ago. I like they can be used for the different seasons. The bird napkin rings tie in nicely with this theme. I love these pretty copper gourds. They come in copper and gold and can be found at Safeway. I am sure by now, they are marked down for clearance, making way for Christmas decor. I am using the burlap bags to hold the flatware. I dressed them for the season. in the past, I made homemade caramels and gave them away as dinner party favors. The two tall crystal candle holders, I also dressed with autumn candle rings and birch battery candles. 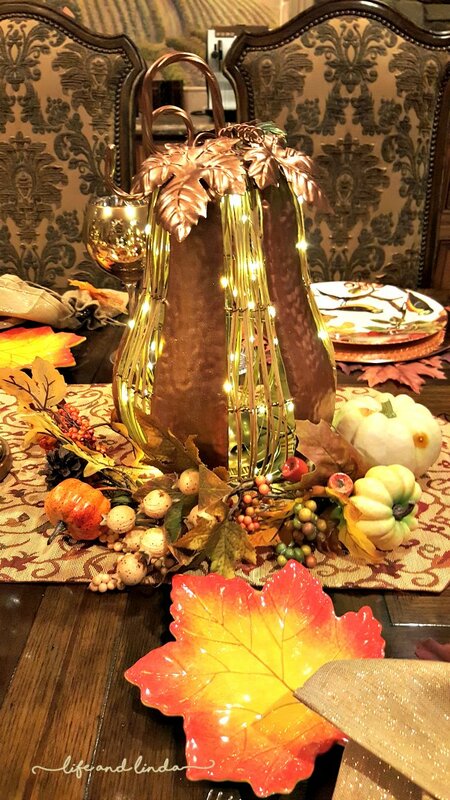 A lovely autumn table runner dresses the table nicely and makes a great base for all of the decor to create a lovely centerpiece. Bird plates- Home Goods Bird napkin rings - Zgallerie Copper gourds - Safeway Gold goblets - Zgallerie Leaf placemats - Pier1 Crystal candle holders- Home Goods Napkins - Home Goods Rust birds- Ross Leaf plates - Ross Birch candles - Michaels ________________________ Sharing at some of these parties Wishing you and yours a lovely Thanksgiving. P.S. The Pumpkin Ice Cream Torte was a big success at the dinner party. I also made Brownie Delight Trifle. Oh my gosh Linda, your table is so elegant. I love those copper gourds that light up. 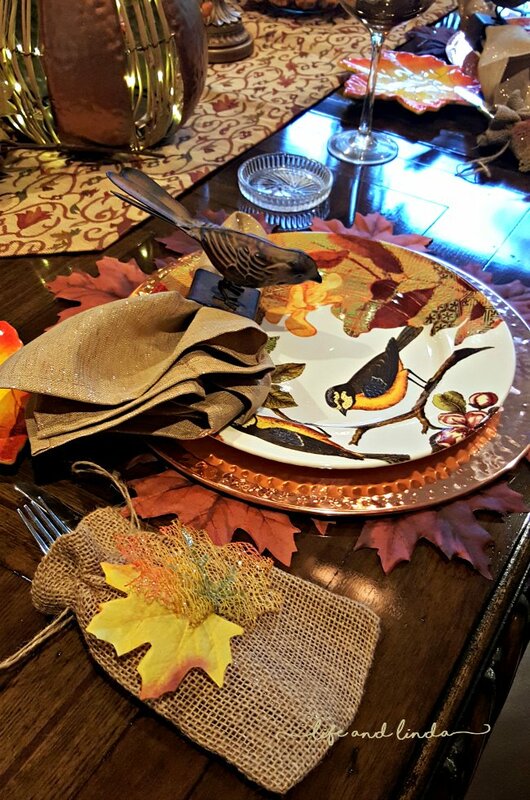 The bird plates are too cute and the burlap flatware bags add a touch of rustic. I'm sure your guests loved the caramels and your desserts! Wow! You must be so thankful:) Your posts resonate that you are grateful for everything.Happy TG! So pretty- love the dishes and those copper gourds are really unique! I’ve never seen anything like them around here. 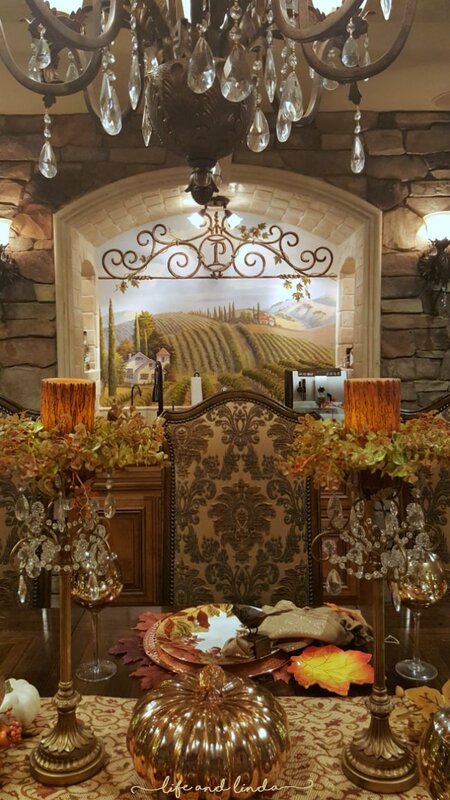 It’s a beautiful table to enjoy whether you dine there or not! I’m actually going to have the kids and grandchild here for Thanksgiving- it’s been along time since I’ve had a chance to celebrate a holiday here! Wishing you and Paul a wonderful Thanksgiving Day! 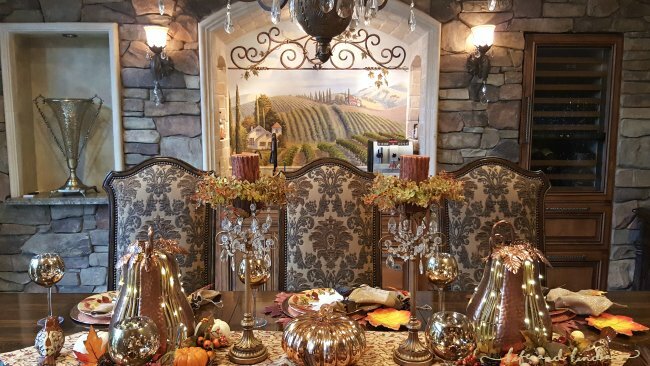 Dear Linda, my sweet friend, this is such a beautiful Thanksgiving Table! 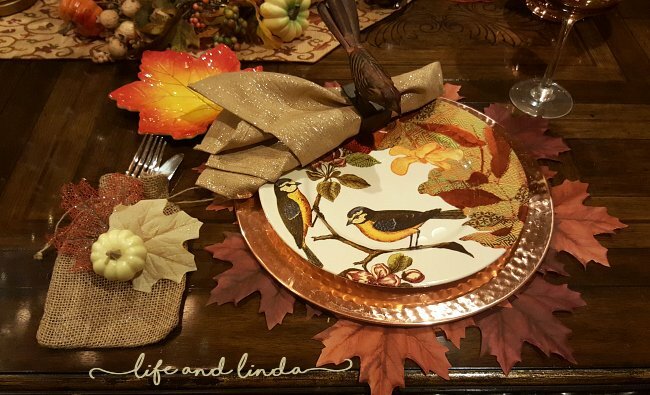 Linda, the bird plates are just beautiful. 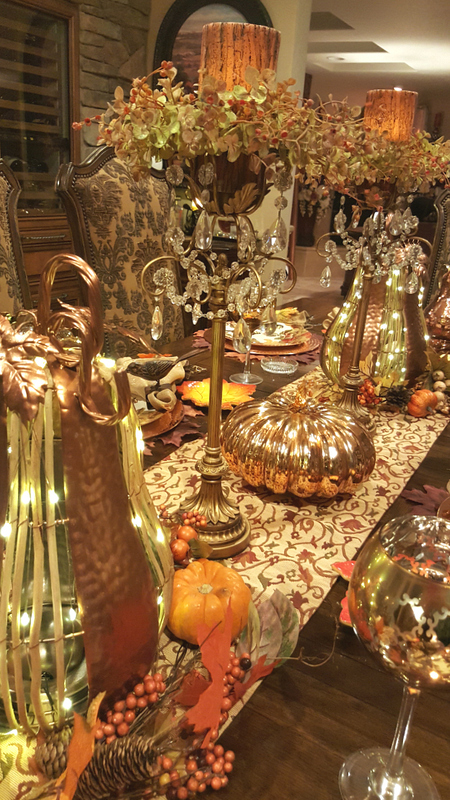 Your table is perfect for Thanksgiving with the copper gourds and the cute burlap bags for flatware...rustic elegance! Happy Thanksgiving to you and yours! Beautiful table, Linda! Have a delightful Thanksgiving. Feeling gratitude for your friendship. Beautiful table! Love those gourds! !